Two killed in clashes in the Egyptian city of Fayoum, as Morsi supporters continue protest campaign against his overthrow. Two people were killed in clashes on Friday between protesters and police in the Egyptian city of Fayoum, AFP reported, citing local security officials. Supporters of ousted Islamist president Mohammed Morsi have pressed a protest campaign since his overthrow last July, despite an extensive crackdown that has killed more than 1,400 people and imprisoned thousands. One of the two killed on Friday, a 52-year-old man, was suffocated by tear gas during the clashes in Fayoum province southwest of Cairo, according to AFP. The other fatality was a woman, but the officials did not say how she died. Protests are expected to continue as Abdel Fattah al-Sisi, the ex-army chief who toppled Morsi, stands in a late May presidential election he is expected to win. Sisi is widely backed by Egyptians who want a restoration of stability, but Morsi supporters consider him the mastermind of a coup against the country's first freely elected president. 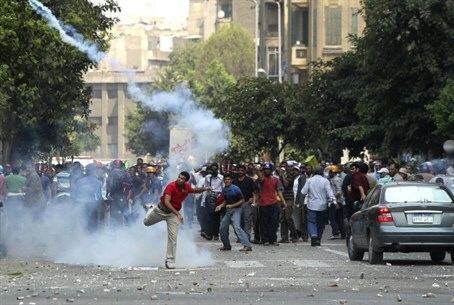 Morsi is currently on trial in several cases. In one trial he is being accused of inciting the killings of opposition protesters outside the presidential palace in December 2012. In another trial, Morsi and 35 others, including leaders of the Muslim Brotherhood, are accused of conspiring with foreign powers, the Hamas terror group and Iran to destabilize Egypt. Hundreds of Islamists have been placed on trial since the Islamist president’s ouster and some already given death sentences, a move which was criticized by the international community. In addition, the Muslim Brotherhood has been outlawed and has been designated as a terrorist organization by the army-led government.